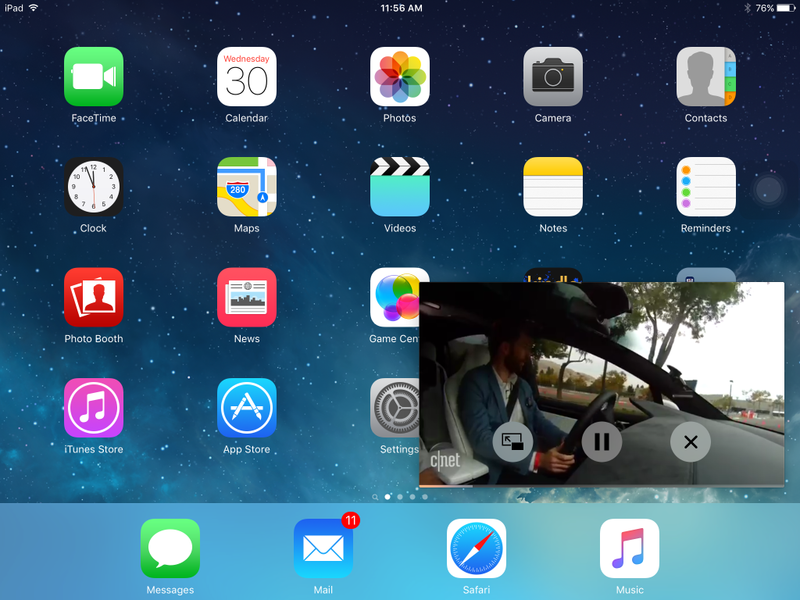 “Picture-in-Picture”, the iPad only feature that comes with the iOS 9 update on newer iPads, is a new multitasking tool that requires minimal effort to integrate on existing video apps. This is also the first time Apple is introducing true multitasking on iOS, and it is unlocking exciting new opportunities and use cases for app developers. I’ve just started seeing some content owners take advantage of it and it looks as if it will quickly become a standard feature. For users, using PiP is seamless. It works automatically without requiring any activation. While in an app, simply press the home button and the video will minimize to the bottom corner of the iPad screen. You can then expand the size of the video box and move it around and reposition it. This is a significant new feature especially for video streaming apps. In talking with Haystack TV, a video news platform, the company has already taken advantage of PiP where news clips will now play continuously while users are multitasking outside of the app. For example, users can check their email while watching the news or even search the web for more background information on a particular news clip that’s playing in PiP mode. For iOS developers, the integration is easy if you use AVPlayerViewController or WKWebView. As long as the user has the video playing full screen, the support for PiP is available without requiring further development. Keep in mind that with all implementation, developers will need to set the media AV session to AVAudioSessionCategoryPlayback to enable their app to run in the background. For those using AVFoundation, the process could be a little more complex and may call for a AVQueuePlayer to ensure video clips continue to play sequentially in PiP mode. You would also need to make use of the AVPictureInPictureController to handle the controls and state changes for starting and ending PiP. It requires a little more work but should not create too much of a roadblock. This new iPad-only feature essentially mirrors how users are using their home TVs – watching video on the big screen while also utilizing a second screen to browse or interact with others on social media. According to an Accenture report, 87% of consumers use more than one device at a time. Bottom line, it’s a feature that could significantly improve user experience while not requiring too much effort to build. « Next-Gen Video Needs Next-Gen Audio: But at What Cost to License?